UPDATE: Morty the corpse flower is blooming now. 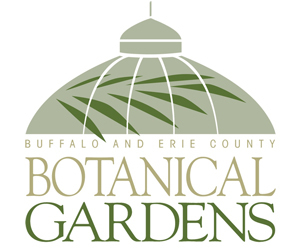 Today, Saturday, Aug. 9, the Buffalo and Erie County Botanical Gardens will be open from 10 a.m. to 11 p.m. 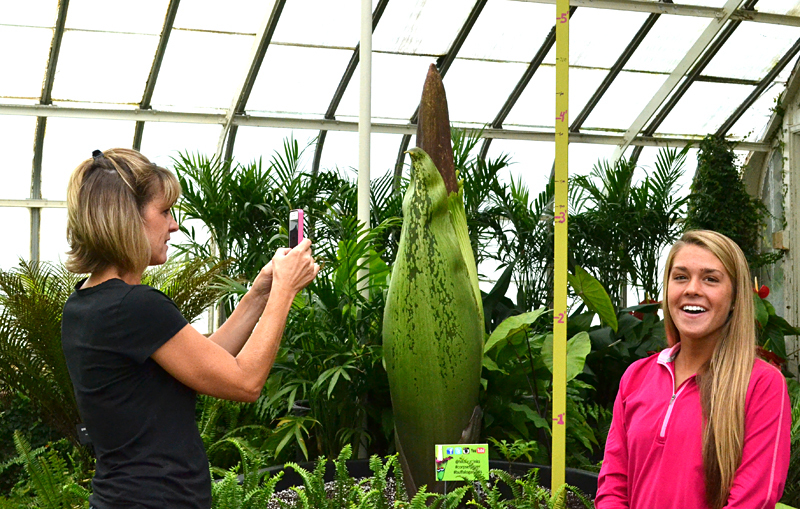 The last admission ticket will be sold at 11 p.m.
See a video of Morty in bloom here. In a rare event that might happen only once a decade, a corpse flower is likely to bloom within the next nine days at the Buffalo and Erie County Botanical Gardens, 2655 South Park Ave., Buffalo. 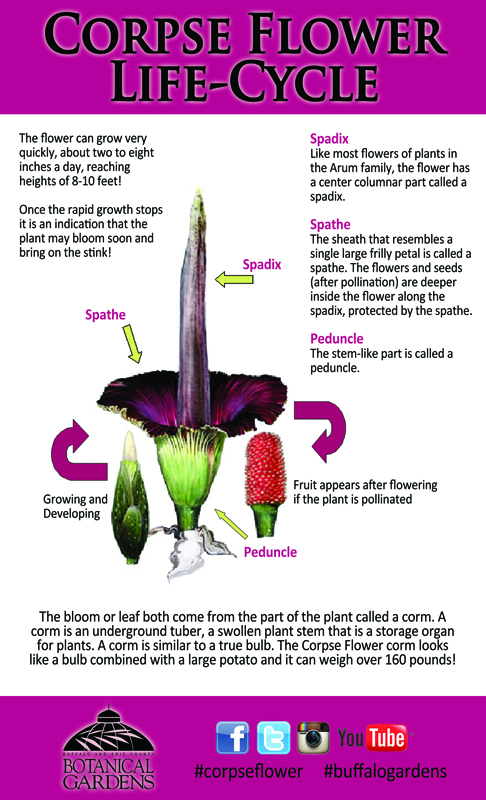 The corpse flower blooms every 6 to 10 years. The blossom of the corpse flower or Amorphophallus titanum is known for its horrible aroma, which smells like rotting flesh. Many botanical gardens that display corpse flowers have given their specimens nicknames, and the one at the Botanical Gardens in Buffalo is called Morty. Morty is on public display now inside the Botanical Gardens and, depending on the bloom, will be on display through August. The plant grows quickly– two to eight inches a day– and can achieve a height of six to eight feet. When it opens, the flower, and the accompanying stench, lasts only 24 to 48 hours. Because it has such a short bloom time, the Botanical Gardens plans to have extended hours. You can receive updates on the plant, extended hour information, fun facts, and its blooming stage on the Botanical Gardens’ Facebook page and through Morty’s Twitter account @Mortystinks — “like” and “follow” to get regular updates. If you post about the plant, use hashtags #corpseflower and #buffalogardens. This may remind you of the voodoo plant that a local home gardener grows, but the Amorphophallus titanum is much larger. The flower itself will weigh about 100 pounds, Thompson said. “The amount of biomass it has put on in the last week astounded me,” he said. When he left for vacation, the plant was 18 inches high. A week later, it was four feet tall. That rate of growth would be like a human starting as a newborn and in 11 days growing to the size of a schoolbus, he said. Not only is it getting taller, it’s getting bulkier, too. “To us plant geeks, this is an amazing thing to watch,” he said. The plant has the largest compound flower in the world and the largest leaf– the leaf can be 20 feet tall. The Botanical Gardens wanted to buy an Amorphophallus titanum corm and went to the supplier that Phipps had used. 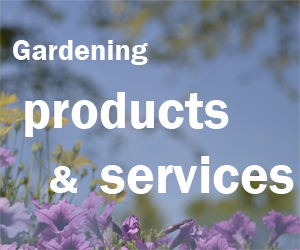 The company was going out of business, and gave the Gardens a deal on three corms. The corms arrived at the beginning of July and the largest corm, Morty, which was likely to flower, took off. A second corm is beginning to bud. That plant will need a name; you can enter your suggestion when you visit the Botanical Gardens. Within a month or so, staff should know whether the bud will also be a flower or whether the plant will be in a vegetative state, that is, growing leaves. The plant goes through a number of cycles of vegetative state, then dormant state, then vegetative, then dormant, until at some time instead of going into a vegetative state, it blooms. The staff is still waiting to see what the third corm will do. Amorphophallus titanum is in the Arum family. The plants are native to the rainforests of Sumatra, Indonesia. Great Article Connie! Our “Morty” is going to be taller than Phipps’ “Romero” – Cool!! As fun as it would be to see, the smell might make me think otherwise. It’s fun to know you can see beautiful plants and flowers and also the unusual, even the rare at the Buffalo Botanical Gardens. Donna, I’m excited to get pictures of the plant in bloom, but when I think about the smell, I’m wondering how I’ll do. It takes me so long just to set my exposure, I might pass out before I snap a shot! Linda, I was thinking today that the Botanical Gardens is kind of like a museum for flowers. It collects and displays plants we might not ordinarily get to see.